Can the Personal Address Book be disabled in Lotus Notes 6.5? I understand names.nsf (the personal address book database) contains necessary settings for the Notes client. So is there a way to disable the adding of contacts to this database and the searching of this database for matching contacts with the Address Autocomplete feature of Notes. The reason is that in Notes 6.5 there is not a way (or our developer staff haven't found one and IBM just wishes Notes 6.5 would go away, and I wish Notes itself would go away) to set the address autocomplete to not search the personal address books or to search them only after the global address book. I work at a bank, and there have been several situations where staff have entered names and allowed the autocomplete to find the first match recipients, but it has found the incorrect recipient and the users did not catch it. We already have pop-ups whenever users send to external recipients asking if the users verified all recipients. Conditions: - We cannot disable the autocomplete feature in Notes. Other processes are dependent on this and the greater IT organization will not allow it to be disabled. - We will be migrating to Outlook 2010 in a couple months so we are not terribly concerned about use backlash at this point. In fact, we'll be encouraging people to migrate their address books to Outlook as part of this restriction. The point is we need to put an additional barrier between users personal address books and any autocomplete function. I can't recall if the 6 personal address book has these options or not, but I know the 7 one does. 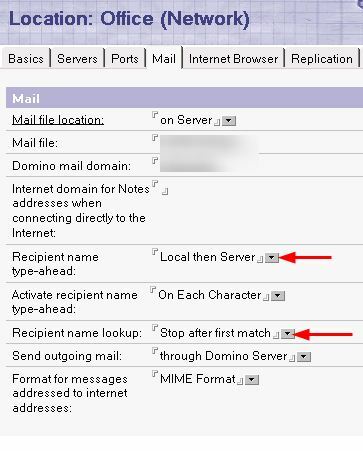 On the mail tab of the location document, there are preferences for Recipient name type-ahead and recipient name lookup. I think you want to change from the default of "local then server" to one of the other options, although the others might not have server first either. On the recipient name lookup field, you can tell it to exhaustively search all address books, so that it will show all the matches for the name, and not just the first one it finds in their personal address book. Not the answer you're looking for? Browse other questions tagged lotus-notes address-book or ask your own question. Getting Outlook 2007 to use the global address book? Reinstalling Lotus Notes, what files to save? How can I merge Address Books in Outlook 2013?